For the second year in a row MapsPeople is delivering the Indoor Navigation of Google Cloud Next. Last year was our first time at the event, and we are very pleased to be re-engaging with Google again this year. MapsIndoors was also used for wayfinding at Google Atmosphere in Tokyo - twice - but Next'18 is on a completely different scale, as it’s one of the largest Google events in the world. Google Next is the place to be for Google Cloud developers, partners, and customers. It’s a place to learn and get inspired by the tools, technologies, and services that Google Cloud is building. Throughout the three-day conference, attendees explores the latest cloud-enabled technology through sessions, workshops, machine learning activities, partner tracks, technical training, and other skill building activities such as hands-on codelabs. With more than 200 sessions and thousands of attendees, wayfinding would undoubtedly become a problem for many. That’s why Google once again have chosen MapsIndoors for indoor wayfinding at their event. 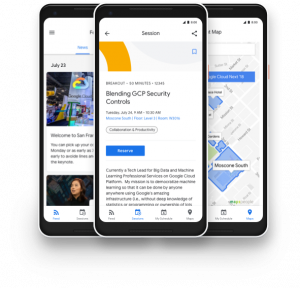 Through the official Google Next webapp, attendees can search for everything from keynotes, workshops, and codelabs to other points of interest such as restaurants and amenities. Users are always given the best route to their destination based on their current location. Attendees also have the option of creating their own personal program for the day by adding stops along their route. This way, they can easily navigate through a tightly packed program. Administrators from Google will have full control over the MapsIndoors solution with the accompanied content management system. This allows them to add temporary points of interest that’ll automatically disappear at the certain time and date they have set. This ensures that Google’s indoor map is always up-to-date with today’s activities. If you want to know more about indoor navigation for events, take a look at what we did for Mobile World Congress 2018. Google Cloud Next’18 takes place on July 24-26, 2018 at the Moscone Center in San Francisco. If you’re visiting, please drop by booth w2214 and say hi. Of course, you can look for us in the event app and get the exact route to our booth. We will showcase some of the latest innovations within indoor navigation that are creating a smooth and stress-free experience for your many customers. You can also book a meeting with us at the event. Hope to see you soon at Google Cloud Next’18.